Temperature control is very sensitive which provides immediate heat adjustment. Change the setting, and the pot responds instantly. Great for going from a boil to a simmer. There is 17 power levels which gives you absolute control over cooking temperature. 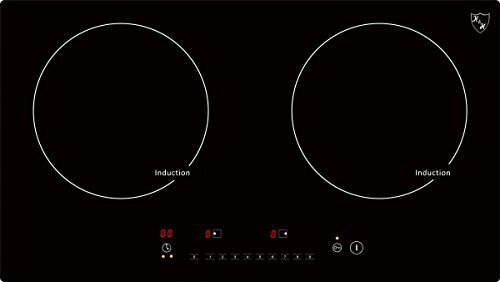 Our induction cooktop is quicker than gas units and also gives you advantages of being able to better control the power and set timers. Unique design with digital display and touch control. Our products carry 1 year warranty. In case of malfunction, contact us to start warranty claim. We will either repair or replace it with refurbished or new unit at our discretion. Shipping cost will be covered by us. For customers that are not from USA we will provide necessary parts for their cooktops to be fixed. If you have any questions about this product by K&H, contact us by completing and submitting the form below. If you are looking for a specif part number, please include it with your message.